This entry was posted in Bill Clinton, Culture War, Fear Mongers, Iran, Islam, Judaism/Jews, liberal hypocrisy, Liberals/Democrats/Left, Media, Middle East, Obama, Race, Racism, Religion, social media, Terrorism, United States, US Presidents, War on White People and tagged Ayatollah Khomeni, Iran hostage crisis, Islamic revolution, Linda Sarsour, Louis Farrakhan, Mohsen Rezaei, Nation of Islam, Tehran, Twitter, University of Tehran, US sanctions, Women's March. Bookmark the permalink. Basically we have here two racist cult leaders having a photo-op. They both are repugnant. the Muslims can have you! He should not be allowed back in the US because he has denounced the US and chanted Death to America in a country that is our enemy and has visited that country that wants to have us disappear. He should be arrested. There’s a photo of Linda Sarsour holding up her left index finger, it looks like right in someone’s face. Even if she was just kidding she might have been arrested for making threats with a deadly weapon. I wonder what kind of welcome Farrakhan and Sarsour would get trying to colonize Iran. I am convinced that the Deep State’s intentions re. : Iran are not clear, pure and good. That being said, I don’t trust Iran’s leadership, either. 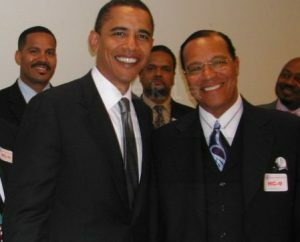 Hey, Farrakhan, if you don’t like it here, no one is holding a knife to your throat making you stay here! And you’re not just an anti-semite, you’re anti-everybody. Stop wasting God’s air and water. The same guy that said G-D America on 9/11 and sobama attened his church for years but nothing sunk in regarding hatred of America because the messiah was concentrating on lowering the ocean levels. HO HUM. Business as usual for the Barrack Insane Obama crowd.